Find out what's happening on the January calendar of events. Here is a QuickTime VR panorama of Tisdale from its outskirts with some reflections about its past year and the next. Vowing not to do it the impulse was to strong and yet another New Year predictions have been produced. Each picture has a link. Some great pictures of a few houses but an interesting set of animatied gif images of a yard in daylight and at night. Edwin Wallace discusses the Estey report on Western Canada grain handling and the rather off-handed way it and government view the affects this matter has on the quality of prairie life. Tisdale's banks are all excellent service providers and the Royal Bank has recognised its Tisdale Branch as one of the best in the country. Warmer temperatures after the Christmas cold snap are inviting to get out of the house and appreciate the fresh air. This article includes a cross country ski report. Jennifer's getting a wind up article ready for us. After returning from Mexico mid-December Jennifer Shire is putting together her pictures and recollections for an article or series of articles on what its like going to college in a land as different as Southern Mexico and the cultural shock of returning home. We hope to see this material in the coming weeks. Concern and some suggestions to prevent injury when walking on icy and slippery walking surfaces. Here since September, Louis Dreyfus has their own locomotive to move cars around their siding. A photo essay for those people who are not familiar with drifting snow. Pictures of ground drift under shiny skies. Competition got underway at the RecPlex Wednesday tickets are $8 a day or $25 for the week event. Scores updated after each draw on this page. This is a complete report on the major announcements at the MacWorld conference with some indicates as to how this will affect public computer products in general. Large quantities of sun dried alfalfa bails surround the Arborfield Dehydration plant. A discussion about the seasonally normal cold weather we are experiencing. The beautiful and modern Carrot River church has vanished following a mysterious fire Christmas Day. Five classrooms operate in the middle of a major overhaul of the Red Earth High School. Students attended extended day classes and even night classes to keep up with their studies. Back on August 6, 1998 Ensign had an article on trees and mentioned a special tree on the Red Earth reserve. Here it is, pictures of this unusual tree. The pictures tell the story of renewal and positive outlook toward a brighter future for this reserve East of Nipawin. SaskTel Mobility Cup, Senior Men's Provincial play-off wraps up this afternoon with the final game between Ray Field of Melfort and Al Kehler of Regina's Highland club. Mario deSantis returns to Ensign today with a pointed and sharp comment about the negotiations and situation threatening health care in the province. Nostalgia and memories of school yard fun are being made at Tisdale Elementary. A safety reminder about the build up of ice on natural gas chimneys and vents warning about the dangers of carbon monoxide poisoning from poor combustion. A QuickTime VR look around Extra Foods at their new addition of signs and what that means for the consumer. This article explains how the most recent developments with computers and servers can impact on education and the learning environment. Discarded Christmas trees are gathered for fire in February. Grain company announces Wednesday its expansion to Aberdeen Saskatchewan giving it four locations in this province. A picture of the sunrise and a comment about the rapid change in temperatures. A photo-essay of a sample of trucks met at the 4-way stop at the junction of highways 35 and 3 at Tisdale. Edwin Wallace expresses his opinions about the Wheat Pool's declining popularity and the unsettling trends in Canadian grain marketing. Mario deSantis shares with us his understanding of accounting software and how it can be used by all of us. Mario has packed into this little article a wealth of important information as well as a set of references that could really help you get your books under control. Warmer weather Friday and Saturday let families and individuals get outside and enjoy themselves. This photo essay shares that experience. Pictures and details about the Rambler's defeat last night at the hands of the Hudson Bay Hunters. Mario deSantis expresses his indignation and deep concern about the cavalier attitude toward the taxpayer and how the healthcare agencies intend to deal with this serious problem. On January 14, the provincial association released the draw for this year's play-offs and Tisdale is competing with four teams. Senior Ramblers, Midget "A", Bantam "A" and PeeWee "A" their draw can be seen by clicking on the team. Well sort of, work has begun on creating a thorough and complete index of the material created so far as part of Ensign, and this project is going to take a while but, the framework is there and it works even though it only contains a fraction of the material, but have a look around. Perkins Elk Game farm East of Melfort is an interesting example of agricultural diversification. Several links on last page of article. The culprit of the Y2K Nightmare in Health Care is plain Corruption! An authoritative and fully documented report by Mario deSantis on squandering of funds in healthcare over the Y2K problem. Some philosophical pondering by Timothy Shire about nostalgia and what it means for us as we accumulate experience. A QuickTime VR panorama of the items in this year's annual fund raising project with a description of some of the Federation's work. Last week the question about where the logs were coming from came up and today we have the answer. Each year course are conducted to train prospective drivers to handle the big rigs that cruise around, what's left of Saskatchewan's road system. Courses in air brakes and actual tractor operation are ongoing in Tisdale at this time. 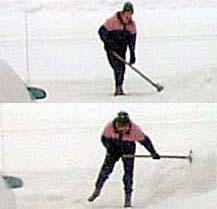 A few pictures and some explanation of the use of motorised snow machines, "Skidoos". Snowy morning in Tisdale. With -15 and light snow we got out our snowblower to clear the driveway. As you can see it is a "good morning" I truly love the blue shadows on snow they are subtle and yet more then the absence of light. Though -26 that sun will warm things up and the wind is gentle from the South. Skidooers are filling their tanks. Ensign is proud to post articles as well researched and yet easy to understand and apply to our daily world. Mario deSantis gives us some serious food for thought about the education system today as it points out the positive and progressive means to making that system better. It is a much gloomier morning then yesterday (pictured above). This morning's grey sky has high cloud and below that a few long thin layers of stratas cloud but as sunrise approaches one can see beneath the cloud toward the East which suggests that it is not as solid as it appears. However some parts of the province do expect snow later today. Almost balmy -13 this morning with a wind from the South. Enjoy the Bard's day. The majasty of the Canadian cordilleran is illustrated in a series of aerial photographs of the winter scenes South of Watson Lake Yukon. As you can see above (8:55 this morning) I need to shovel off our sidewalk. Remarkably calm this morning and promises to be an excellent day. Timothy Shire tells you about his grandfather's family, their trials and tribulations as he begins a series of articles on the concept of "the family." Provincial hockey play-off draws are on Ensign they were postedlast week. Check the letters, an interesting one from Mike Townsend about Cassiar. Two QuickTime VRs show off a beautiful Tisdale house now dressed in its winter attire. Curiousity arises from the flow of more logging trucks through town these ones coming from the North. At 96 this Crooked River farmer continues to enjoy life and his flock of pigeons. Wildlife Federation's fund raiser tomorrow night, some pictures of trucks and future stories. There is no adult rationality to play, for it is a thing unto and for itself alone. Here are some pictures of Tisdale Elementary children enjoying the warmer winter weather and the new snow that has swept over their domain. Edwin Wallace presences a short but chilling message about a technological break through now owned by Monsanto that could present enormous difficulties for humans as a living entity. Here are some pictures of this morning's unusual sunrise and an explanation as to what you see in the pictures. This page has eleven pictures and takes 48 seconds to download. The pictures are a sequence of images taken while driving into the sunset Friday afternoon. These are spectacular digital images with comments about the process. What a day! This is what it looks like at 10:00 and the snow is melting. Here is a short discussion about our obsession with weather conditions. Some interesting pictures of the Bjorkdale area with the moonrising as the sun was setting Saturday afternoon. Mario deSantis explains the use of software designed to teach students calculus. This practical article gives you a look at this software cuts down on the learning curve. So here we are at the end of another month, this new year is already partly used up. With only a couple of warm days already the snow in the fields is disappearing. This picture was taken yesterday near Eldersley (East of Tisdale) at 5:30 and shows the snow cover disappearing.